Fallon Emery - Airman For A Day, Warrior For A Lifetime - USA Patriotism! On Dec. 4, 2013, Melanie Emery Dallis lived every parent’s worst nightmare – learning that she might outlive one of her children. A CT scan revealed that Melanie’s nine year-old daughter, Fallon, had a mass on her brain. She was rushed to the Medical University of South Carolina for emergency surgery, during which doctors discovered that Fallon had a glioblastoma multiforme – one of the deadliest forms of brain tumor. She was given 6-14 weeks to live. Fallon Emery says she didn’t fully understand the gravity of her situation when she was initially diagnosed because she was so young and everything was moving too fast for her to process. It wasn’t until after her initial surgery that Fallon was able to absorb her surroundings. She remembers feeling a sense of calm, as if time was slowing down around her. “By the time I was out, the shock finally wore off and I was just confused about everything that was happening,” she said. “My mom was trying to be strong, but she was crying and I could see it even though she tried to hide it. I could see her going through so many emotions. Fallon beat the odds and lived well beyond her original prognosis. Melanie laughed before clarifying that she wasn’t joking. “Her oncologist truly believes, medically, that the reason Fallon is still here is the red-head gene slows the growth of her tumor,” she explained. Regardless of what caused Fallon’s unlikely recovery, Melanie said she is grateful for the time she has with her daughter and for the support their family received throughout their fight against cancer. Word of Fallon’s fight against cancer eventually reached the 437th Airlift Wing Commander’s Action Group, who reached out to units across Joint Base Charleston, S.C., for ideas on how to recognize her for her effort. 437th AW senior leaders decided that Fallon was a great candidate to visit JB Charleston as part of the Airman for a Day program, which provides opportunities for children battling various illnesses to visit the base and experience life in the Air Force. Since November is recognized as “Month of the Military Family,” it was a fitting time to make Fallon an honorary Airman. First Lt. Thad Sollick, a C-17 Globemaster III pilot assigned to the 437th Operations Support Squadron, just happened to be near a phone when the CAG called his office. Sollick began coordinating with Deborah “Flash” Stephenson, founder and CEO of Courageous Kidz, Inc., to learn more about Fallon’s story and plan a day she would never forget. 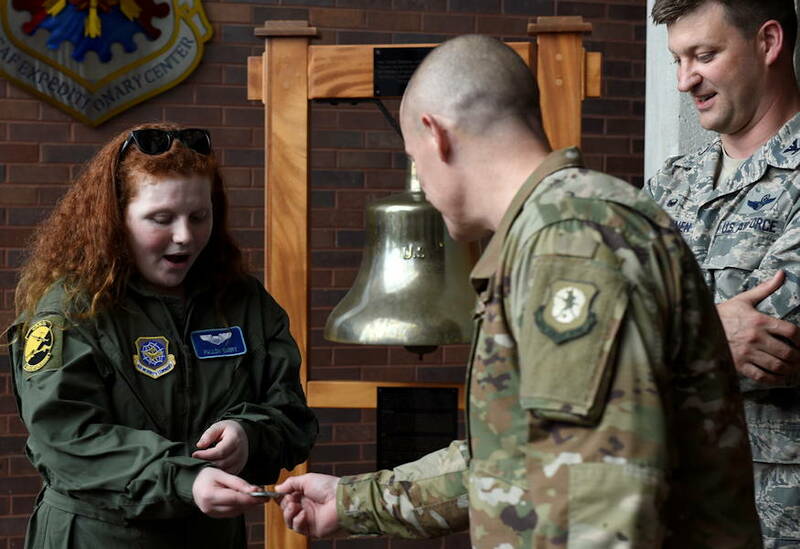 Like most of the experiences to honor Fallon’s bravery, the Airman for a Day visit to JB Charleston was a closely-guarded secret from her until she arrived. “She really didn’t have a clue, we had been planning this for three months,” said Flash, who has been working with Fallon and her family for nearly five years. Fallon arrived at the 437th OSS facility to a standing ovation, received a flight suit with unit patches, took her official photo and started her day as an honorary mobility Airman. Sollick escorted Fallon, Melanie, Mae and Flash around JB Charleston to experience airpower and the air mobility mission. They learned about night vision at the Aircrew Flight Equipment facility and used a flight simulator before touring a C-17 on the base flight line. But the highlight of the visit, according to Fallon, was controlling an EOD robot. She also tried on a bomb protection suit during that portion of the visit. “I liked everything, but the robot was one of my favorite things because I love things like that,” she said. At the conclusion of the tour, the family met with ZumBrunnen and Chief Master Sgt. Ronnie Phillips, 437th AW command chief master sergeant, both of whom presented Fallon with their official challenge coins. Today, Fallon still has a tumor in her head. Doctors performed a second brain surgery but could not remove the entire mass because it was too close to the parts of the brain that control memory and physical control. In addition to multiple surgeries, Fallon has endured a total of 33 radiation treatments and 84 chemotherapy treatments, which caused extensive weight loss – she weighed about 50 pounds at one point. She also had to re-learn to walk after being bound to a wheelchair due to neuropathy caused by the treatments. But Fallon wasn’t the only one affected by her condition. Her sister Mae had to miss pre-school because doctors feared she could pick up germs that could put Fallon’s health at additional risk. Even at her young age, Mae was keenly aware of her older sister’s condition. Fallon, who turns 15 in December, says that her experience has given her a unique perspective on life. While other children her age focus on good grades in school and getting into college, her main focus in is making sure she keeps connections with friends and spending time with her family.